How long does a moment appear to you? 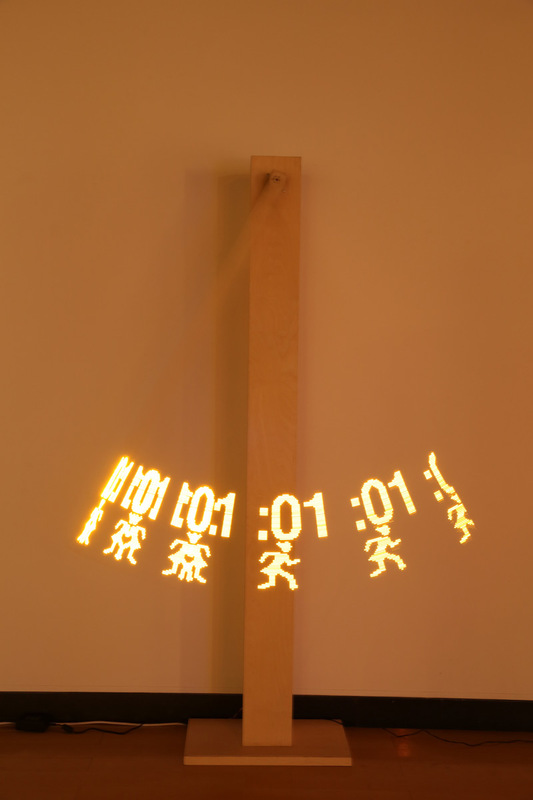 ‘A Moment’ is a kinetic display using a POV (Persistence of Vision) display and it swings like a pendulum while displaying an ephemeral message of numbers and a running figure icon. This project started with an idea of how to visualize a sense of time, a moment. Using an ephemeral display using a POV message, the audience would feel different sense of a moment. 순간은 얼마나 짧게, 혹은 길게 보일까? ‘순간’은 자작나무로 만들어진 키네틱 설치물로 180 센티 높이의 타워에 달린 150센티 길이의 긴 추가 마치 시계의 추처럼 좌우로 움직이며 시간의 흐름을 순간의 빛의 POV (시각잔상효과)문자로 디스플레이한다. 나무로 만들어진 추는 좌우로 움직일 때 마다 마치 목탁과 같은 소리를 낸다. 마냥 바라보고 있자면 명상속으로 빠져드는 듯하다.